After years of pondering, a few failed launches due to lack of skill in dealing with the complexity of these pieces, I began to undertake colouring the Delicate Balance series. Over the last 6 months I have coloured three of the original ink drawings digitally, using Photoshop. 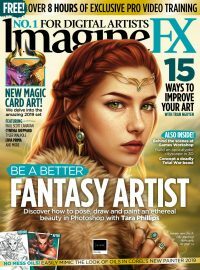 I have learned a lot from colouring these and they are responsible for an incredible increase in my speed and knowledge in new techniques, in both colour theory and Photoshop (even though I have over 10 years experience using the software). With each piece there was a drastic increase in my speed, much more then at any other point in the past and this makes me very excited about the future and the amount of work which I will be able to turn out once my time and focus is strictly on my art. Even though I have an idea of what a picture will look in my mind when I begin, I am surprised by unexpected things which happen by accident, due to the materials or media doing things that I never thought about. This is the great thing about art and my artwork, that after all these years I can jump into a piece with a sketch and an idea, even a colour scheme picked out, and I can still be amazed at how a work turns out. It is such a rewarding feeling when the finished produce is better then you imagined. 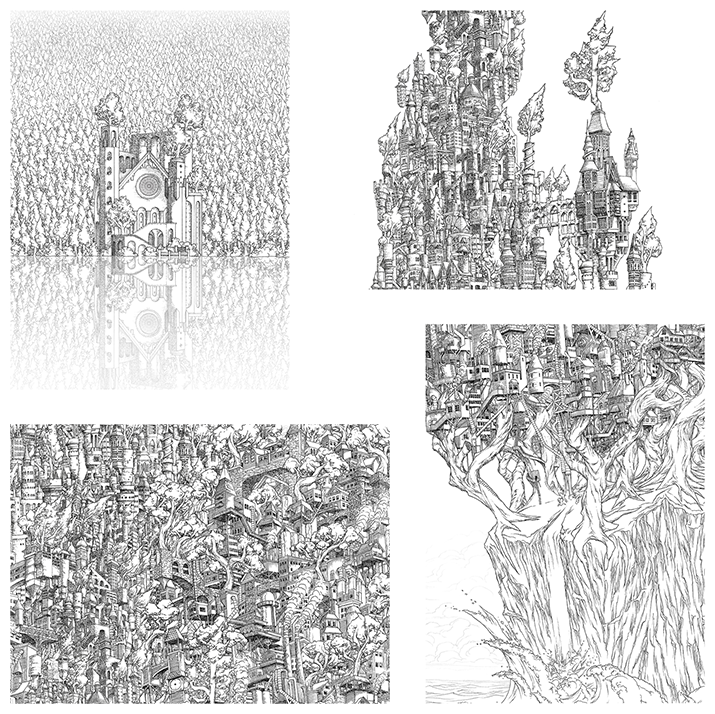 Originally, these pieces were all drawn by hand using a half millimeter Micro pen. This was a part-time project that took a nearly five years, consuming hundreds and hundreds of hours, a handful of pens and a lot of patience. 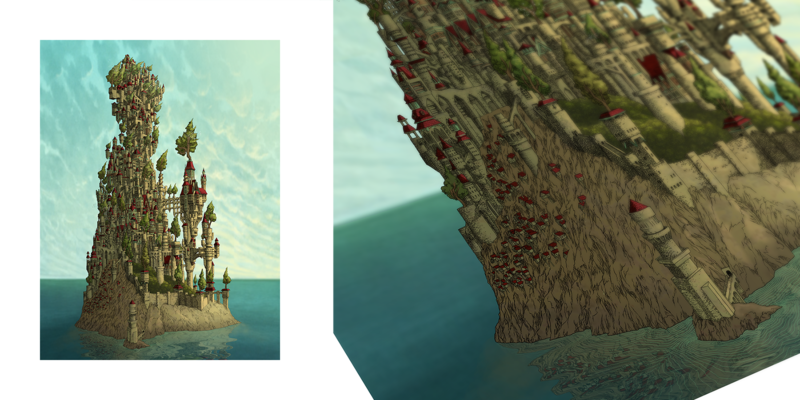 Only the fade out of the clouds and water effects were created digitally using Photoshop, except for the Treehouse, which I pushed the ink out of a pen and filled it with water so it got lighter as I drew. This was too daunting of a risk to take on the other pieces though because the fade out required was a greater area and with the time invested up to that point was not worth the risk of ruining to whole drawing. 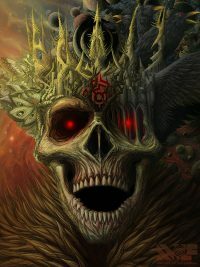 Each piece was then scanned into the computer and coloured using Photoshop. The Delicate Balance series explores the relationship between architecture and the natural world. 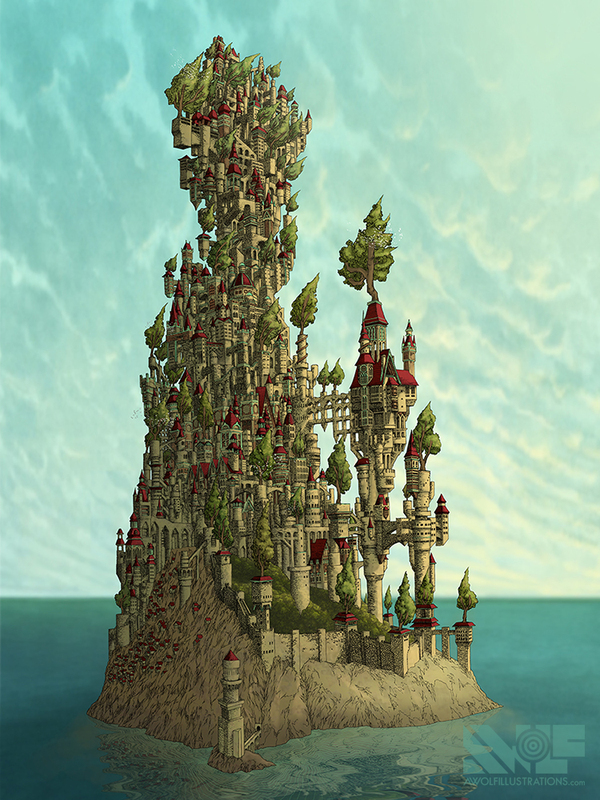 Castles and fortified communities of fantasy and medieval influence coexist with and in nature by incorporating natural elements throughout the architecture of the structures. Trees provide for the communities with shade for cooling, fruit and nuts for nutrition, and air to breathe, as well as habitat and sustenance for the wildlife. Interconnected pathways link structures, as do the utilities that provide heat, water distribution, and waste removal. 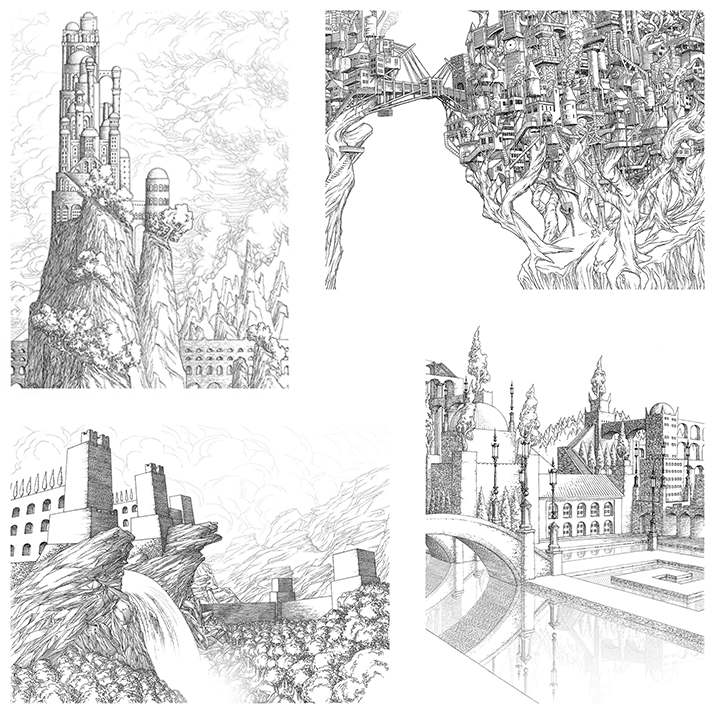 Water plays an integral part in each illustration as it is the source of complex life; it is intricately entwined into each piece as rivers, waterfalls, large bodies of water and aqueducts, which all wind throughout all the illustrations. Sunlight is also beginning to play a role in the newly coloured pieces in this series and can be seen as light rays, reflection upon the water and the light which brings spring fruit and nuts to the treetops which attracts flocks of birds. 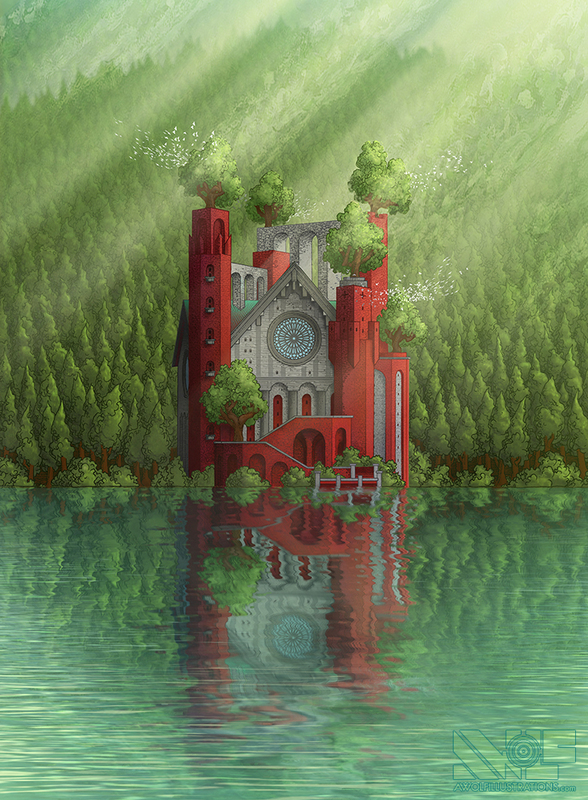 The Lakeside Cathedral was the first that I coloured and even though it looks the least complicated of the three, it took by far the longest amount of time. I had to learn to do quite a few new techniques and watch many different Youtube tutorials to achieve the reflection on the water. The brick texture and all the different shades and shadows made it quite difficult as did colouring all the trees in the background. It’s a lot of trees. I really like the reflection on the water and I think the colour and texture of the water makes it look quite realistic in a stylised way. To colour this one it took about 50 or so hours on Photoshop with a few revisions over the months to correct little things but it was all worth the time. 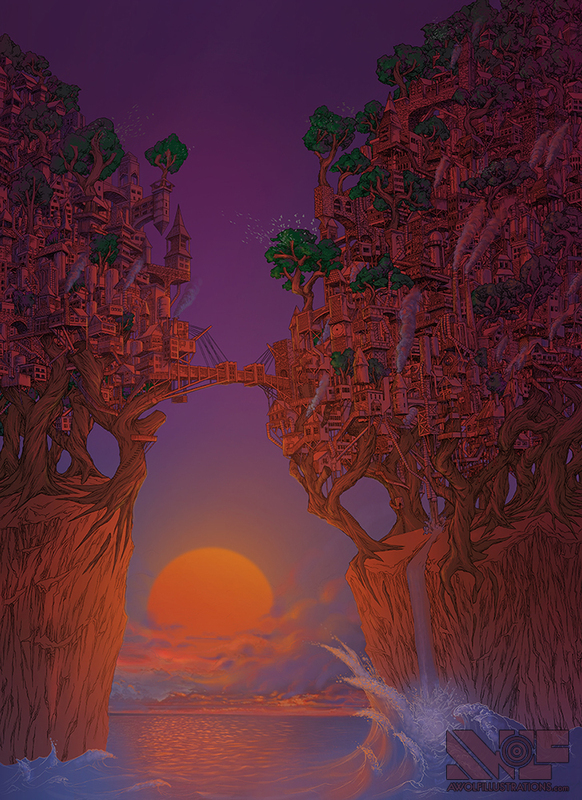 The Treehouse was originally drawn nearly five years ago and at the time it was the first large hand drawing I have undertaken since the end of high school. I attempted to colour this one a few years back but abandoned it after I realised the way I was going about colouring it would take hundreds hours to complete. I thought about it for years and it was only in the last few months, with the knowledge and tricks I gained over the last few years and from colouring the Lakeside Cathedral that gave me the confidence to undertake colouring this piece. 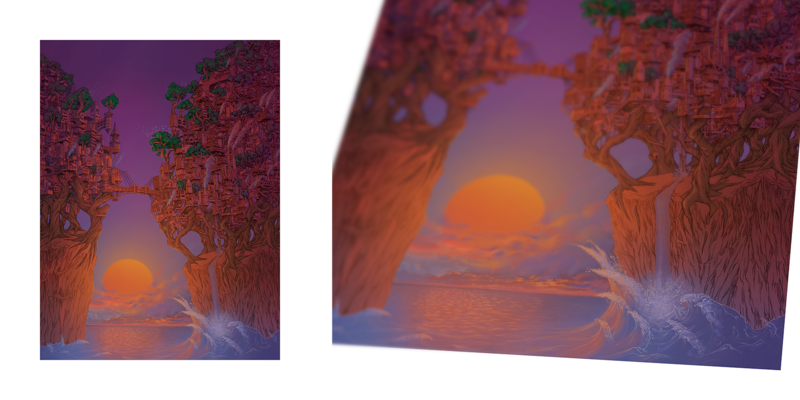 I really like that the colours are very similar on the outside but as you get closer to the sun in the middle, the orange of the light and the purple of the shadows separate and the green of the trees stands out. Once again I think the lighting, especially that which reflects off the ocean surface brings a calm and peacefully feeling to this piece. 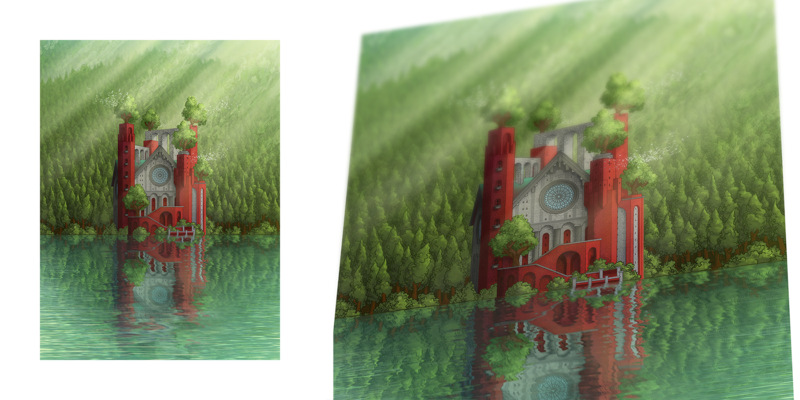 Even though this piece is more complicated and features a lot more buildings then the Lakeside Cathedral, it only took less then half the time to colour. In total I only spent about 20 hours on the computer for this piece. The Kingdom was the last one I completed which took about 8-10 hours in total and was about one half the time as the Treehouse, which again took half of the time of the first piece, the Lakeside Cathedral. I have never completed the colouring of such a complicated drawing such as this, in such little time and with such ease. What I have accomplished with these makes me think I have stepped up and reached a new level with my artwork and makes me very excited about what I will accomplish with my art in the near future! There are limited edition prints of all of these available in the STORE section of this website. This includes a set of all three of the coloured 24 x 30″ = 61 x 76.2cm pieces, each of which is a signed and numbered limited edition of 10, with certificate of authenticity. A set of all four black and white reproductions of the original 16.5 x 23.4” = A2 42 x 59.4cm ink drawings, each of which is a signed and numbered limited edition of 100, with certificate of authenticity. And a set of 8 smaller 9 x 12″ + 22.8 x 30.5cm prints for a person with a smaller budget.